Len remembered a perfect camping place on Cooper’s Creek from a trip he’d taken with a friend a few years ago, so we eschewed the main camping area and headed down a side-track on the left. When we got there it just didn’t look right. We decided to walk through the bush along the river bank looking for the spot. After about 10 minutes we found it. Len then walked along a vehicle track back to the road. We had turned off too soon. Soon we had a beautiful fire on the go. Len and I finished off the beer we had brought from Alice Springs which our ice box had kept cold for eight days. That night we had a not entirely successful damper. Len has a radio powerful enough for clear reception. We ended up listening to the last 20 minutes or so of a rugby union test between the Wallabies and the All Blacks which the Wallabies could have, should have won! The task for the day was to drive 735 km to Emerald, first through towns you don’t hear about very often such as Jundah and Stonehenge to Longreach and thence down the highway to Emerald. More grazing country after Longreach, gun barrel straight roads and lots of road kill. Towards evening we came down a range, to enter our third major river basin for the day. We arrived after dark. I recall the eerie lights of coal mines on the horizon, working 24/7. 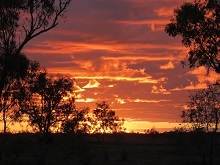 Note: This post is the thirteenth in a series on our Red Centre holiday. Wishing all a very merry Christmas. After a bit of a rest there may indeed be more travel posting in the new year. Brian, those photos are just wonderful. Why would anyone want to live anywhere else? Cooper’s Creek was certainly worth a separate post.